If you’ve ever worked in a school, you know who’s responsible for keeping everything together. Hint: It’s not the principal. It’s the school secretary. A good secretary has the ability to keep a school running smoothly. From ensuring the copier is always working to checking up on kids who are absent from school, the school secretary plays a very important role in a school community. 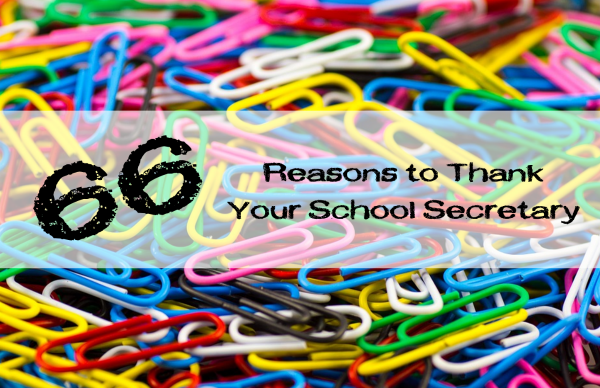 In honor of Administrative Professionals’ Day, we’ve come up with 66 reasons to thank your school secretary. Of course, it doesn’t have to be a holiday for you to tell your school secretaries how much they mean to your school. 1. The school secretary is often the first person to greet visitors to the school. 2. The school secretary fields phone calls from upset parents. 3. The school secretary has the ability to keep upset parents from visiting your classroom. 4. The school secretary knows how to find an accurate phone number for nearly every student. 5. The school secretary helps manage meeting and conference schedules, which can often be confusing. 6. The school secretary knows when a student is absent and if a student has been absent a lot of days. 7. The school secretary can make last-minute copies for you, even if you’ve exceeded your monthly quota. 8. The school secretary can get the custodian to your classroom in an instant, even though the custodian has been avoiding you for hours. 9. The school secretary knows all of the juicy gossip. 10. The school secretary knows and can easily access nearly any form you need to fill out. 11. The school secretary gives students a talking-to while they wait for the principal. 12. The school secretary often gets paid much less than the value she provides to the school. 13. The school secretary often has to work during the summer (and during some school breaks). 14. The school secretary helps make sure every student has a schedule at the beginning of the year. 15. The school secretary makes sure the crossing guard and flag raisers get their job done every day. 16. The school secretary makes sure buses arrive on time and finds out where buses are when they’re late. 17. The school secretary makes sure announcements are delivered at the proper time. 18. The school secretary helps control the fire alarms and announcements during safety drills. 19. The school secretary serves as the PR firm for the entire school. 20. The school secretary comforts kids who are sick, feeling sad, or just having a rough day. 21. The school secretary listens to teachers who just need to vent. 22. The school secretary often puts together and sends out the school newsletter. 23. The school secretary helps ensure a smooth transition for students transferring into the school. 24. The school secretary can answer nearly any question about the school that people call to ask. 25. The school secretary can tell you where your elusive principal is at nearly any given moment. 26. The school secretary knows who’s a walker, bus rider, or going to after-school care. 28. The school secretary has to listen to the ringing of the phone all day long. 29. The school secretary often has to eat lunch while sitting at her command post. 30. The school secretary is a master multi-tasker. 31. The school secretary makes sure the copier is always working, whether she fixes it herself or calls the repairman. 32. The school secretary has the ability to magically find the supplies you forgot to bring for your classroom. 33. The school secretary keeps the school calendar updated and lets everyone know of any changes. 34. The school secretary schedules substitutes when teachers call in sick or need a day off (and can often get the sub you really want). 35. The school secretary makes sure the vending machines in the teachers’ lounge are working and well-stocked. 36. The school secretary signs for important packages, such as approved grant applications. 37. The school secretary fills teacher mailboxes with important mail and announcements. 38. The school secretary serves as an in-school communication system, passing messages between teachers. 39. The school secretary serves as an in-school postmaster, putting stamps on letters and making sure they get out in the mail. 40. The school secretary often sends around a card or organizes a group gift for birthdays, funerals, and other life events. 41. The school secretary often spends the entire day in the office, rarely getting to move around. 42. The school secretary has access to tons of data on students and teachers and manages to keep it all confidential. 43. The school secretary has the ability to ward off bill collectors and sales people when they call looking for teachers. 44. The school secretary often serves as a mediator in conflicts between staff members. 45. The school secretary is in charge of ordering key supplies for the school. 46. The school secretary often has a stressful, hectic day and still manages to keep a smile on her face. 47. The school secretary helps students get instruments, lunch boxes, and other items their parents drop off because they left them at home. 48. The school secretary knows where every student is supposed to be at a given moment. 49. The school secretary has the ability to determine whether a student really needs to call home or is just trying to get out of class. 50. The school secretary writes late passes for students. 51. The school secretary often serves as the first point of contact during an emergency. 52. The school secretary makes sure all visitors sign in and are issued visitor passes. 53. The school secretary knows when to call 9-1-1 during an emergency. 54. The school secretary is usually one of the first to arrive in the morning and one of the last to leave at night. 55. The school secretary is often responsible for making sure students get medication when the nurse is out. 56. The school secretary helps arrange field trips. 57. The school secretary can often find a lost pair of sneakers or discover which student stole something from a backpack. 58. The school secretary knows how to use Power School or whatever new system the district adopts. 59. The school secretary helps coordinate room assignments for teachers before the school year starts. 60. The school secretary keeps meticulous files of all important paperwork and other key information. 61. The school secretary often helps handle many of the school’s financial accounts. 62. The school secretary helps compile the endless reports and sets of data requested by the district office. 63. The school secretary helps get your money back from the vending machine when it malfunctions. 64. The school secretary helps organize and distribute items related to school fundraisers. 65. The school secretary makes sure everyone gets his/her picture taken on picture day and distributes the pictures when they come in. 66. The school secretary makes everything she does look like a piece of cake. Do you have more reasons to add to the list? Share why you love your school secretary in the comments.